A theme that I’ve heard many times at business and innovation conferences is that the large organizations kill passion and stifle innovation. At last year’s BIF-7 conference, I asked Dan Pink, author of Drive and A Whole New Mind, if large companies can innovate and he said, “No”. At the World Business Forum last year, Jack Welch said that the argument of companies innovating is a red herring; he said that it is people who innovate. At the recent Dell Wyse CIO Summit 2012, Paul Maritz stated that one of the biggest challenges of a public CEO is keeping the passionate, high-performing employees from leaving. Paul Maritz ran a 10,000 person division of Microsoft, was founder and CEO of a small startup (Pi Corporation) that was acquired by EMC, became CEO of VMware (which has grown to over 11,000 employees) and now moves back into EMC to become chief strategist. He said that the goal of a company is to help people feel that they are doing important work as part of a shared effort and that the structure of the company is helping rather than hindering progress. Size of a company is an obstacle and Maritz states that companies over 20,000 employees are never perfect. I’ve worked at companies large and small and the balance of process and productivity is a tough balance regardless of size. Some thought leaders and authors have written that the industrial era reporting structure should be abolished. While it sounds promising overhaul management, it is the lack of management oversight and checks and balances that led to the Enron scandal. Paul Martiz stated that the number of people where dysfunction (my word) starts outweighing productivity is 20,000; others have stated that anything larger than a military battalion (around 1000) cannot all be motivated towards the same goal efficiently. Passionate communities are tough to maintain. Early adopters move on to the next great thing, events lose steam over time and love of brands has a short half-life. The VMworld conference is my favorite show of the year, mostly because it brings together such a passionate community. The bloggers, entrepreneurs, engineers and thought leaders are so diverse and engaging that for the third year in a row, I left the show with my brain full, feet aching and voice shot from non-stop talking. This was the first VMworld that was over 20,000 attendees. While no event of this size is going to keep everyone happy, I have been hearing some rumblings from a number of constituents that the event organizers need to watch out for. First of all, I heard from a number of end-users that there were many sessions that did not meet expectations. A number of the sessions were reported as being too basic, too marketing/product focused or just too boring. I know many passionate vExperts and bloggers that have been calling for a VMworld unconference for the last 2 years to deliver proposed sessions that for one reason or another don’t make the cut. While VMware has to keep its sponsors happy, there’s usually a big gap in passion and delivery between a vendor-assigned presentation and one from a volunteer that shares what excites them. One of VMware’s greatest assets is the halo that the company gets due to the passion of the various communities (VMUGs, VCPs, vExperts, etc); this must be upheld to win the battle against Microsoft and other challengers. Whether you were at VMworld or not, check out the full coverage of videos and articles from SiliconANGLE and Wikibon on our curated VMworld 2012 page. Networking had huge buzz at the show due to the Nicira acquisition and theCUBE got an exclusive interview with co-founder Marin Casado, see my article here. I also did videos with EMC TV (watch here – interviewed by Matthew Brender) and TechTarget (watch here – interviewed by Colin Steele). Thanks everyone for the conversations and interviews at the show! As always, feedback and questions welcome. In writing about technology, I believe that there is always a never-ending demand for more basic, “101 level” information. Too often, we can forget that while end-users might be interested in hearing about the next big thing, they often aren’t even buying the brand-new version, but are working to optimize their legacy environments. If the chasm between the “future vision” and the customer’s reality is more than a few generations of product, there is a real chance that the terminology and operational models will be so foreign that it will scare off those all but the most aggressive early adopters. I try and explain the gap between the vision of where things are going and how customers can move towards adoption of new technologies. I was a guest on Mike Laverick’s Chinwag podcast. The audio and video of the discussion are available here: http://www.rtfm-ed.co.uk/2012/04/18/chinwag-with-stuart-miniman-episode-73/. Topics of the conversation included flash storage, convergence solutions, desktop virtualization and more. Big Data? No. Big Decisions Are What You Want. Both sessions are part of the Storage Track; details are available here. 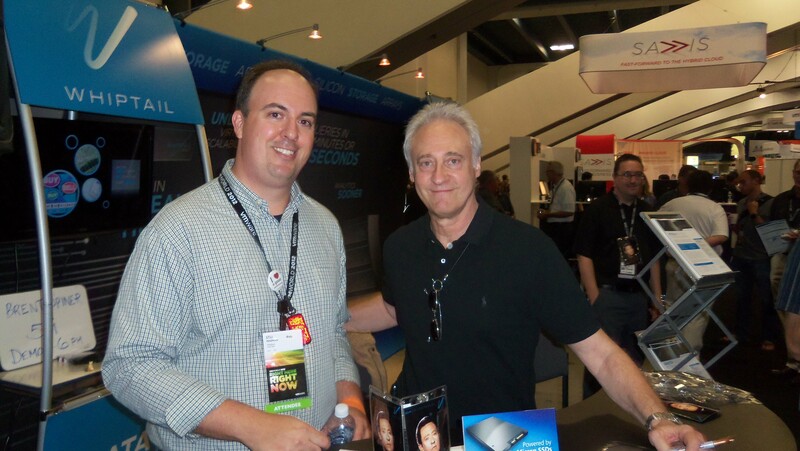 I’ll be back in Vegas the week of May 21 for EMC World – I can’t believe it’s my 10th year at the conference. SiliconAngle and Wikibon will be broadcasting live video with theCUBE. I will have a presentation on Converged Solutions near the Blogger’s Lounge – I’ll update this post when the time/date is available. UPDATE: My BUZZ Talk at EMC World “Data Collision: How Virtualization is converging the Enterprise” will be 2-2:30pm on Mon, May 21st – details here. I expect to be at a few other shows this year (including Dell Storage Forum in Boston and VMworld in San Francisco). As long as my schedule allows, I’m always happy to do podcasts, videos or simply chat about technology and/or social media. I’m easy to contact here, on Twitter (@stu) or through Google+ (stuminiman). Finally, a big thank you to VMware for naming me a vExpert for 2012 (my second year) – see the full list here. Hi, thanks for stopping by and obligatory apologies for not having posted in almost 3 months. I’ve still been quite active on Twitter, sharing on Google Reader (also goes to my other Twitter account), and writing about IT for work. Here’s a quick update on some of the things I’ve been involved with lately. Earlier this month, I was interviewed by Countdown to Storage Expo (a UK-based marketing group), here’s the link: Storage Networking & Social Media Maven: Q&A with @Stu Miniman, Principal Research Contributor at Wikibon. After doing the interview, I found out that I will be attending my first SNW next month. Big Data is a nascent trend which is at the intersection of analytics, mashups, cloud computing and some really smart data scientists. After watching the O’Reilly Strata, I wrote a blog post explaining some of the basics of this trend. Cloud computing is a huge portion of the IT landscape. My angle has traditionally been from the enterprise perspective, since I was working on “private cloud” solutions back when we simply called them next-generation or virtual data center solutions. As with most technologies, enterprises must balance existing legacy equipment an processes with the desire to take advantage of newer cost and operational models. I wrote a piece on hybrid clouds discussing solutions that look at bridging private and public clouds. Server virtualization has seen strong adoption from companies of all sizes and desktop virtualization is seen as one of the next significant areas of growth for virtualization. While there are plenty of success stories across many verticals that are adopting virtualization, the overall solution set is still fragmented. I posted a research piece discussing the journey that the ecosystem needs to undertake to mature VDI. Of course, I still keep a close eye on the networking space, especially storage networking technologies like iSCSI and FCoE. My most recent article on the topic discusses unified/flex ports which have the capability of switching between Ethernet or FC, giving customers flexibility and investment protection. In addition to SNW, I will also be attending EMC World in May and likely a few other conferences in the upcoming months. If you’ll be at one of the shows, I’m always happy to chat about the various technology spaces or social media. Conferences usually give me lots of ideas and plane time to write, so I hope to update this blog more often in the coming months. In March, Pat Gelsinger introduced EMC’s vision for Virtual Storage (my blog post is here). Today, EMC announced the VPLEX family of products—the first new products that deliver on the vision. VPLEX is a Distributed Federation solution, which means that we can enable a single copy of data to be shared, accessed and relocated over distance. When new technologies are introduced into the marketplace, people are most comfortable in making comparisons to things that they already know. In this post, I’ll compare traditional replication solutions with VPLEX Distributed Federation. In a traditional replication solution, there is a primary site and a secondary site for failover or recovery of data. In contrast, with VPLEX, the data is active at both sites at the same time. Rather than putting together complex failover scenarios, having the flexibility to have active data between sites will allow for maintenance without downtime and workload balancing across multiple data sites. Instead of thinking of “site A” and “site B” separated by policies and distance, we can start to think of our pool of federated resources that spans multiple physical data centers. VPLEX can change how you think about deploying data centers; rather than a disaster recovery site, deploy data centers to achieve additional efficiencies (such as taking advantage of low cost energy) and performance (optimizing locations to be close to clients). The network between the locations is critical for any solution to work. Similar to replication solutions, we can consider whether a solution is synchronous or asynchronous and how the network fits into a customer’s existing environment. Enterprise customers will typically have network connectivity between locations that are close to each other. When these existing links have the appropriate bandwidth and other network characteristics–such as those required for replication solutions–the same links can also be used for VPLEX. 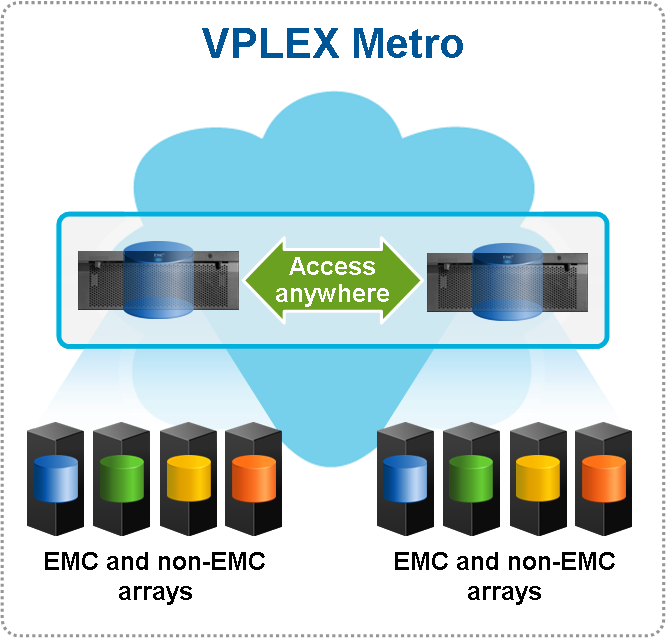 Synchronous solutions of 100km are available with VPLEX Metro today. Longer distance (asynchronous) solutions require special links. Asynchronous solutions will be available with VPLEX Geo in 2011. As I hinted at in my previous post, the VPLEX solution ties into other development work from partners. VPLEX will expand the solutions of VMware VMotion (see this great VPLEX/VMotion whitepaper) and Microsoft Live Migration, plus work with the latest networking technologies from Cisco (including leveraging OTV) and Brocade. Virtualization of your servers, network and storage redefines the boundaries of the Data Center by creating a single pool or resources separated by distance. Click on the graphic above to go to the VPLEX launch site which includes customer videos and whitepapers. You can also hear more about VPLEX live on May 10th with streaming internet TV from EMC World: Pat Gelsinger at will be on at 3pm Eastern and Brian Gallagher at 4pm Eastern. In the realm of storage, I have spent most of my time outside of the storage box, especially how storage networking, servers and operating systems (OS) impact storage. I began working with Cisco and VMware long before the VCE initiative. Some of the broad industry trends that we have seen across the OS and network stacks are also applicable to the storage layer. Pat Gelsinger, EMC’s President and Chief Operating Officer of Information Infrastructure Products, spoke today with a group of analysts to lay out a vision for Virtual Storage. The audio and slides of Pat’s presentation can be seen here (may request your email address to view). This strategy relates to Private Cloud. 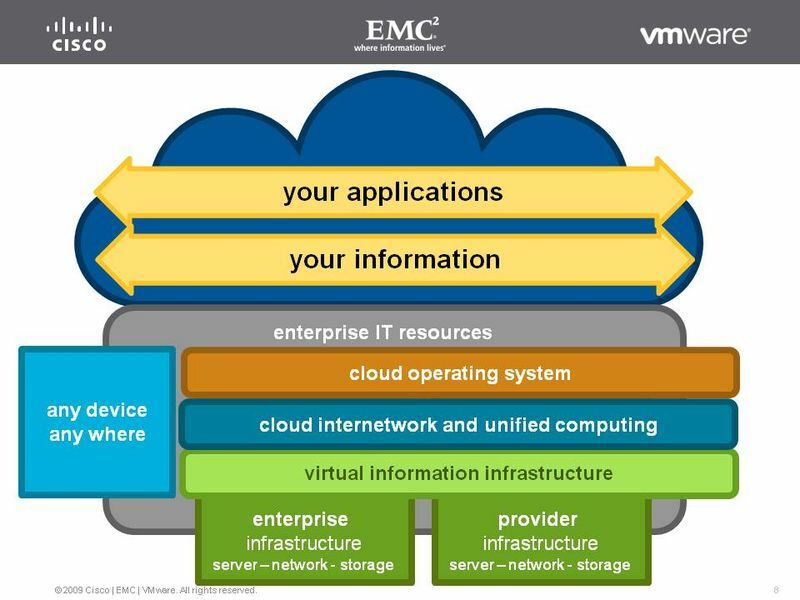 If you look at the diagram below, virtual storage lives in the virtual information infrastructure layer. To understand the trends, let’s look at the OS and network layers of this stack. The first thing that most people think about when they look at server virtualization is how it can help consolidate resources, which leads to a reduction in hardware and therefore to savings in power and space. When I think back to my first interactions with VMware in 2003 (when I was in EMC’s E-Lab), it was actually the abstraction/isolation of an environment that was so useful. Old operating systems (Windows NT) or “odd” environments (FreeBSD) could be put in a VM and EMC’s storage could then support the configuration. In addition to extending the life of an existing configuration, VMware is tremendously valuable for test and development environments. Around the time that we were first working with VMware, they came out with a product that everyone thought was magic when they first saw it – VMotion: Live Migration of a virtual machine. The liberation gained with this feature turned a useful/interesting product into a game changer. Individual server resources could be turned into a pool of resources. With the addition of VMware Distributed Resource Scheduling (DRS), VMotion becomes automated. As a final note here, take a look at some of the plans around extending VMotion over distance that were discussed at VMworld last year. As with server virtualization, the first step towards network virtualization is consolidation of resources. With the adoption of 10Gb Ethernet and storage protocols such as Fibre Channel over Ethernet (FCoE), iSCSI and NAS, we reach a single network for LAN and SAN traffic: a building block of the private cloud. In particular, FCoE allows existing infrastructures built on FC to move towards a unified environment. Another enabler of cloud internetworking is Cisco’s Overlay Transport Virtualization (OTV) which they unveiled last month. OTV allows for mobility of resources across datacenters or with a compatible service provider. OTV leads networking down the same path of automation and mobility that we have taken with server virtualization. Comments are always welcome. You can be sure that we’ll be talking a lot more about this at EMC World, May 10-13 in Boston. I will be presenting Converged Data Center: FCoE, iSCSI, and the Future of Storage Networking. Any bloggers that are attending should sign up for the Blogger’s Lounge. Hope to see you there.